Media usually works on us in subtle, gradual ways. We hear a jingle so many times that it gets stuck in our head, and over time we become convinced that Oscar Mayer wieners are a superior brand. We watch 100 episodes of "Friends" and, after a while, start to actually believe that our lives should also be that easy and frivolous. Ultimately, the things we see and hear on TV can affect how we feel about ourselves, our goals, our lives -but it happens so slowly and imperceptibly that we usually don't recognize it. But, there are also those media moments that transform us instantly. Many people around my age talk about this happening when they saw Star Wars for the first time, as young children. The world, after they left the theater, somehow looked different, more exciting and more alive, and full of more potential, than when they had walked in. And in the movie, Almost Famous , there's a terrific scene near the beginning of the film, just after young William's sister leaves home. 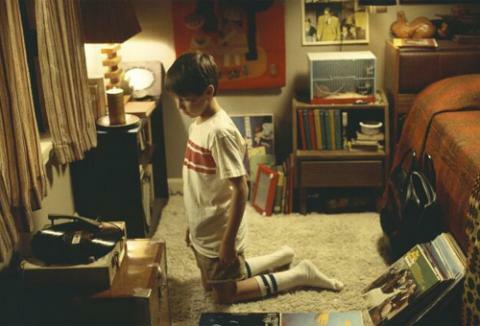 She tells him to check for something she's left him under the bed, and he finds a satchel full of her vinyl record albums. He sits, awed and open-mouthed, running his fingers over Led Zeppelin II , Wheels of Fire , and Axis Bold as Love as if they are holy relics. She also leaves him a note scribbled on a slip of notebook paper: "Listen to 'Tommy' with a candle burning and you'll see your entire future." And there's no question that young William's life will never be the same. My "Almost Famous" moment happened in 1983, courtesy of MTV - back when MTV actually used to play music! Now, I had, of course, heard of Bruce Springsteen before. 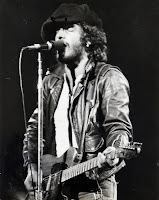 I'd heard "Born to Run " and "Hungry Heart " on the radio, but at the time I kind of lumped Bruce into the same category as other radio-friendly bands, like the Cars and REO Speedwagon (as embarrassing as that is to admit). Anyhow, one afternoon Martha Quinn introduced a "new" (actually recorded in 1978, on the Darkness on the Edge of Town tour) Bruce Springsteen video. I couldn't believe what I was seeing and hearing. The music, the performance, the audience frenzy, the girls mobbing Bruce onstage, were so over the top, so thrilling, that I couldn't keep my mind on anything else. For weeks, I'd camp next to the television, waiting for the next time they'd play Rosalita. Not only is Rosalita a fantastic song, but this performance also captures, absolutely, everything that makes Springsteen great. 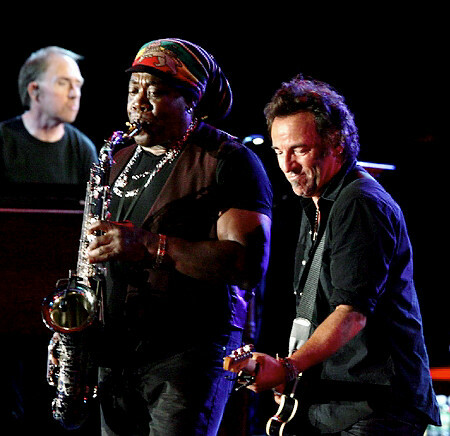 Springsteen is unabashedly melodramatic, beyond the point of corniness, yet at the same time completely cool. The only way he pulls this off is by being 100% committed to his music, his performance, and the spirit that inspired it. And in indulging so completely himself, it gives the rest of us permission to lose ourselves in the music, as well. As an awkward 9th grader struggling with my image, this video suddenly opened my eyes to my own potential possibilities. Bruce Springsteen was cool and I wasn't, but listening to (and vicariously living) his music made me instantly feel more worldly, more adult, more hip. My friends had regular names like Mike, Ted, and Cathy. 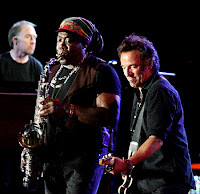 Springsteen's characters were much more colorful: Jack the Rabbit, Weak-kneed Willy, and Big Bones Billy. Even the people in his real-life band were larger than life - the Professor, the Mighty Max, and of course, the Big Man . I longed for the boldness and wit to have sidekicks with such monikers. More specifically, this video set in motion the chain of events that led me to start playing the guitar. Socially, I was too awkward to express myself in words. Rock music and the guitar gave me a way to do so with much more confidence and assurance, and helped me to find my real personality as an adult. Over the years, I've taken one very important cue from Rosalita - to put every ounce of energy into every performance, to get lost in the music and the message, and to forget about how I was perceived. That's a tough lesson to learn, but Rosalita was a great teacher.